Two Department of Education (DepED) Orders in recent years are encouraging developments for Philippine education. One is DepED Order No 74, s. 2009, which institutionalized mother tongue-based multilingual education and the other is DepED Order No 62, s. 2011, a policy framework for indigenous education. 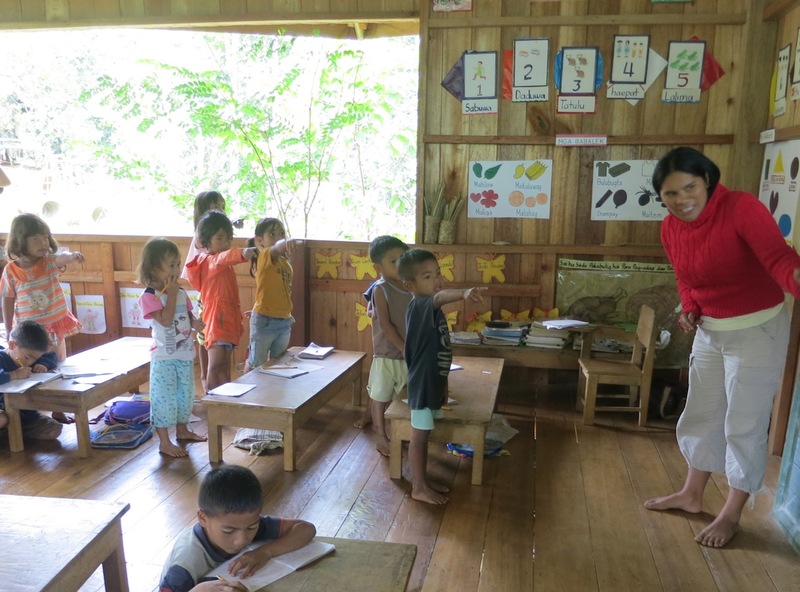 The former recognizes the importance of using the mother tongue in learning and the latter lays out mandates for DepED to ensure indigenous learners have access to culture-responsive education, both in the public school system and outside it. In an indigenous school like APC, both the mother tongue and cultural knowledge are valued. Furthermore, the mother tongue is valued not only because it facilitates learning but also because it is the repository of cultural knowledge. Cultural knowledge is best learned in one’s own language. DepED Order 74, s. 2009 does not reflect this however. The rationale for using the mother tongue is to improve learning outcomes, as results of international tests have shown top performing countries are those that teach their students Math and Science in their own languages. Granted that this data behooves us to also adopt the same approach, the first question that comes to mind is: how are we using the mother tongue to teach? Are we simply translating concepts from English to the mother tongue or are we finding the relevant concepts in the local culture and therefore teaching our students from the conceptual framework of our culture? For example, when speaking in Filipino, we often use words such as komunidad, emosyonal, and konsultasyon, which are really English words with Filipinized spelling. When we use these words, we are still operating from the framework of the English language, and not actually speaking from our culture’s ways of understanding. In working with Indigenous Peoples, the term “ancestral domain” is a term coming from outside. It is translated as lupang ninuno in Filipino. For the Pulangiyen people, however, the concept of domain is embodied in the word gaup, and this has nuances that makes it different from “ancestral domain.” Using terms that come from a different conceptual framework forces a people to think within that foreign framework and abandon their own cultural concepts and modes of expression. So how will we use the mother tongue in education? Its educational value is without question. But what of its cultural value? We have recognized the value of our local languages, but do we also recognize the value of local and cultural knowledge, of our ways of understanding and organizing the world? Language and cultural knowledge are intricately linked. When we use a language, we cannot help but also use the concepts and knowledge in that language. But are we maximizing this in our teaching? Is there a conscious effort to integrate local and cultural knowledge in our teaching? In DepED Order No 62, s. 2011, DepED says it will prioritize offering a culture-responsive education in schools with indigenous learners. Does this approach only apply to Indigenous Peoples? Is the integration of local knowledge only essential for indigenous schools? We sometimes hear DepED teachers express confusion about the different programs they are asked to implement. A few years ago, they were directed to adopt the multilingual approach; now, they are mandated to implement indigenous education. Do teachers see the connection between the two? For teachers and divisions who are not handling indigenous learners, what is the value of a culture-responsive education for them? Another critical question that comes to mind is with regards to learners eventually transitioning to Filipino and English in the higher grades, beginning Grade 4. The National Achievement Test for Grade 6 is in English, and Filipino and English are the main languages of learning in high school. Learning Filipino and English are important, yes, but in this model, it seems like the value of the mother tongue is only in its role as a bridge to other languages. The mother tongue’s conceptual framework is no longer explored, and cultural knowledge is not integrated in the content areas. It takes several years for a person to learn conversational ability in a foreign language, and much longer when using the language in an academic setting and to learn new content. Can ordinary Filipino children learn enough English to be used in Math and Science beginning Grade 4? Data about school performances and even the most basic observation tell us that ordinary high school students, and even college students, have a limited grasp of English. And yet we persist in using English as our main language of learning in these higher levels. Using local languages might require us to laboriously develop learning materials in our own languages, but might such an investment finally ensure our students actually learn their lessons in Math and Science? Do not other countries like Japan learn their Math and Science in their own language all the way up to graduate school? What is also confusing is that although DepED Order No 74, s. 2009 mandates that Filipino and English will be introduced in a carefully planned sequence no earlier than Grade 2, the recently released curriculum guides from DepED show learning competencies for Filipino and English beginning in Grade 1. Beyond the school, what is the value we place on local languages in wider society? Our laws are in English and most of our institutions operate in English. What is the place of local languages in our society? Of local and cultural knowledge in our society? The use of English created a gap between the ruling elite and the poor majority who are largely unaware of how their lives are shaped by decisions and policies crafted in a language that is foreign to them. The views, values, and orientations of wider society shape the educational system where it forms its citizens. Mainstream Philippine society is largely oriented towards the West and this is reflected in our formal education system. Outside of our formal institutions, however, in informal settings, like the home and community, local cultures and languages continue to thrive. We have begun to integrate these in our education system, but are our present efforts enough? Do they reflect a real valuing of local cultures, local languages, and local knowledge? Perhaps when this actually happens in our schools, we can also gradually learn to shape Philippine society so that local languages permeate even the formal institutions, the poor majority get to participate equitably in affairs of the State, and as a country, we can learn to deal with problems not just from a Western perspective but also drawing on the resources of our culture. Jenny Lynn Lee worked with the Apu Palamguwan Cultural Education Center and contributed to the development of systems and procedures in the teaching and learning at the Center. Jen also undertook a systematic review of curricula and lesson plans, facilitated summer workshops with teachers, and continues to maintain a keen interest in the promotion of culture-based education.